When you’re living with dementia, it doesn’t help when people and circumstances keep reminding you of it. This was a good day – St George’s Day – when Lena was able to forget about her Alzheimers altogether. First published in April 2015, when she was still in the relatively early stages. – I really like her. She’s what I call a normal person. From Lena these days, that’s the highest form of praise. Normal. The old normal, the one she still dimly remembers. When she was queen of her own life, and all the choices were her own: where she went, how she got there, who she saw, what she wore. When she could be just one of the girls. When she wasn’t living with dementia. Summer had turned up early. A shirt-sleeved April day, crystal-clear, a promise of good times to come. The town’s primary schools were out in force, kids with their teachers seated on the four sides of the cobbled market square, beaming parents behind, spectators like us mingling at the back. Dragons stalked the arena, launching mock attacks on mocking, giggling children. We knew we could slay them, just like old St George. 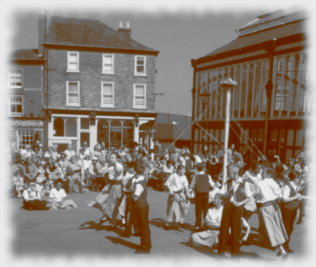 ‘Blaydon Races’ crackled across the square and a group of tots took centre-stage, country-dancing like it was 1955 .. or 1755. The audience began to clap time. Lena joined in – what could be more normal? – Come on, then. Clap! By nature, I’m a reluctant clapper, and besides I was fiddling with my camera-phone. But the woman next to Lena took up the challenge, and a connection was made. I heard them chatting. – Yes, I love this. Is one of them yours? – No, we haven’t got children. Oops – he’s lost his partner. Next up, a maypole dance. Tangled, tattered memories for me – the May Queen and the Boy Bishop – and a chance to wind Lena directly into her Swedish history and heritage. – It’s just like midsummer in Sweden, isn’t it? What do you call the pole? The stång? Or is it the stäng? Bet you wouldn’t put plastic flowers on the top of the pole in Sweden, would you? – No, we use real flowers. I’d said it just loud enough for the other woman to hear. A clue to who Lena was, something she could ask her about. Are you Swedish? And then I moved forward a few steps to take some photos, leaving them alone. It worked. When I came back, they were still chatting away, enjoying the day. Everything was normal. – Are your children dancing? The woman hesitated before answering. I felt her uncertainty. – No. We don’t have children, actually. Alzheimers strikes again. How many times had Lena asked the same question while I was away? Should I say something, explain? No. It was Lena’s conversation, not mine. Why should I shatter her enjoyment of ‘normal’? But how would the woman react? Would she slowly slide away, embarrassed, uncomfortable? In her situation, before, I might have. She didn’t. She stayed with us as violins and accordions played, clogs clumped, and George slew another dragon. Stayed and kept chatting. Ali, if you ever read this, thank you for being fine with Alzheimers. By now, Lena’s forgotten you and most of that glorious day, but what remains is the warmth she felt in your company. And you know what she said afterwards? – I really liked her. She’s what I call a normal person. More Living With Dementia stories here. Won’t Someone Open This Door?